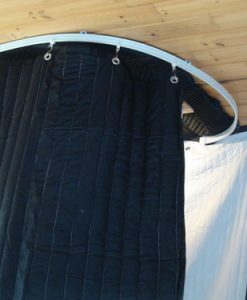 This Hanging Acoustic Vocal Booth provides excellent sound absorption for great audio recording quality. It is designed in a way that it can be hang from a single point in your apartment or office. It is perfect for small spaces when yo need to be able to remove it and set up as needed. The Hanging Acoustic Vocal Booth can be hooked on any ceiling. 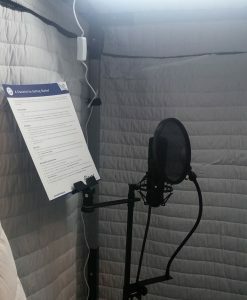 This mobile vocal booth is perfect for those who don’t want to own a full-size vocal booth, have the budget to build a professional recording studio, or have the space for any large gear, such as a permanently standing booth. 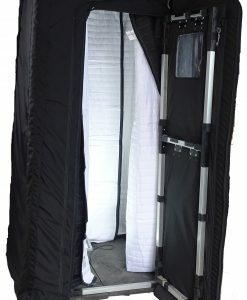 This 40 lb enclosed booth is easy to handle and instantly creates acoustically dead space for great audio recording. 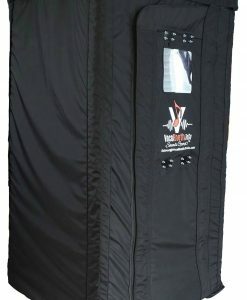 The Hanging Acoustic Vocal Booth is easy to pack and store when not in use. 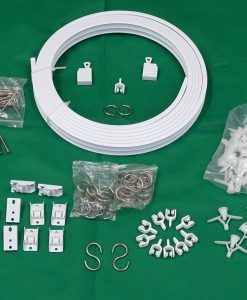 However, if you wish to utilize it often, using a pulley system (as shown) will allow you to quickly access the interior of the booth — no fumbling with parts or screws!